When looking for a perfect shirt dress, the key is to find one that’s straight, but not too wide. I prefer fabrics that don’t have any stretch and are a slightly heavier so they don’t get wrinkled too easily. As for sleeve-length, that’s up to you. I have a good mix of sleeveless dresses and long-sleeve dresses, which I typically ear rolled. About half of the shirt dresses I own have waist ties like this plaid one from Ellen Tracy, which give them more shape and make them easier to dress up. If it doesn’t come with a waist tie, there’s no need to fret, just add a belt for a little waist definition! Winter is here! And chunky scarf is perfect accessory. This long coat from Karlla Gerfeld Paris is totally must have this winter season. It’s not only flattering but also pretty warm. Apparently, I’ve always been a fan of the plaid blazer as my closet is filled with them, but I don’t think I ever fully appreciated them until lately. They’re comfortable, stylish, classic and are very versatile. You can wear them to work paired with a dress or for everyday wear. Dress them up with ankle boots like I did here, or wear them casually with a pair of cute sneakers. Best of all, they fit me like a glove. I got this blazer from Ellen Tracy. Since I received this from the mail it continues to be one that I wear every week. It looks just as cute in the fall with ankle boots and a cute suede jacket as it does in the summer. Thank you so much for stopping by. Have a great week y’all! This is a sponsored post brought to you by Ellen Tracy. The opinions are completely my own based on my experience. OMG amazing style as always LEN !!! You always choose such stylish yet classic pieces, Len!!! I’m always a fan of plaid blazers because they add such an air of professionalism to anything. As for scarves and warm coats…they are definitely a must have…at least where I live!! 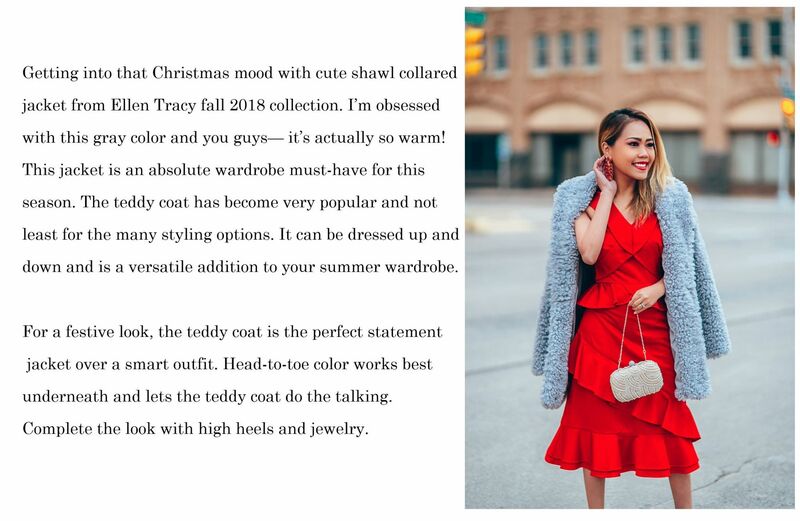 They’re all gorgeous pieces, but my favorite has got to be the red dress with the teddy coat. You look amazing as always! Love all of these classy looks! I am such a coat and jacket person even though I live in SoCal and this furry jacket and chunky scarf are calling my name. You have such amazing style and I admire your styling! Such gorgeous looks! I totally agree with having tie front dresses. They’re great for creating a flattering shape. I love all your looks, Len! You look beautiful in any outfit! I think my favorites are the red dress and tie front plaid blazer. Hope you are having a wonderful holiday season! Ahh, love that first outfit with the bright pink puffy coat against the tweed dress! Marvelous! Gosh your pictures are so amazing and high quality. The jacket is so unqiue and eyecatchy. The perfect combination for the colder days and when you still want to look AMAZING. Loving all those colourful looks Len! A teddy coat definitely is the coziest to wear this season, very stylish. I haven’t really been into plaid blazers until this year! Now I feel like I want to buy ever single one that I see. Great post and outfits as always. Love the coats, you style them so well. You look absolutely stylish and chic. These looks are so amazing, loved how you style your pieces giving visual interest to all your outfits. Great post! Your photos are stunning! You’ve styled and shared SO many gorgeous pieces in this blog post, but the hot pink faux fur coat has stolen all of my attention. Wow, fabulous!! I am so in love with your coats! The dress from Ellen Tracy is GORGEOUS! The red dress is PERFECT for holiday parties – you’re rocking the look! Fabulous outfits dear, especially the first one. You really rock these hot pink effortlessly. So gorgeous on you! All of these outfits are beautiful! I really love that gray coat and the plaid shirt dress. Have a great weekend! All your outfits look beautiful and you look lovely as always! I love the red dress lots! If i get to wear such smart dresses, i would welcome winter with both hands. Love your selections. such pretty and stylish dresses. and You look stunning as ever. These outfits are so stunning, darling! I love the color combinations. Love this whole collections, especially that fabulous red dress! You look gorgeous, Len! This is absolutely gorgeous dear, especially the red boots! Such a fabulous pop of color. Superb outfits! I love the teddy coat and the plaid blazer. All those jackets look absolutely glorious on you my love! Hope you’re having a wonderful week so far! These looks are all so stunning on you, Len! I especially love that plaid blazer. It is winter perfection! you look so good babe! all of these boots are so killer and your makeup is amazing! So fab and gorgeous fashion inspirations. Loving the outfits.Those are some amazing boots. They look great, every single one of them. I love all of your outfits Len! So stylish! The red ruffled dress is perfect for the Holidays! Wishing you a wonderful Christmas!